Whatever happened to Pinocchio after the Fairy Tale Ended? Well I have been thinking about a bunch of Fairy Tale characters when watching “Once Upon a Time” and am thinking I will periodically draw a cartoon of different characters and my take on what they are up to now. 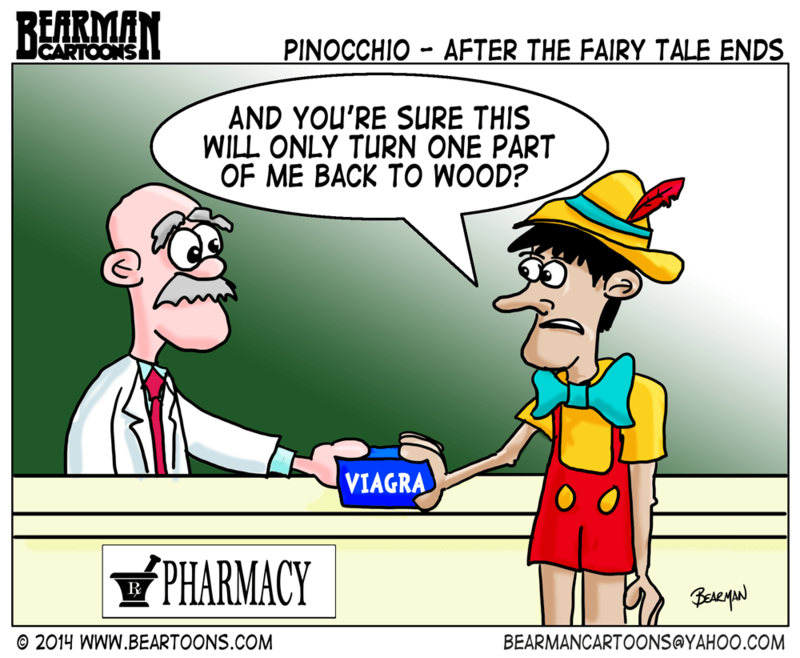 Pinocchio losing his wood made him a ripe candidate to get Viagra from the pharmacist but I think he is right to question the side-effects. We are in the final week so let me know if I missed anyone. I have committed to donating $2130 so far. Doing Pinocchio… Side effects include chaffing, splinters and a possible need for a tetanus shot from a stray, rusty nail! Rusty nail? Well hopefully he gets the hammer working. At Pinocchios age, a rusty nail would be expected! You dont know what kind of kink he’s engaged in over his lifetime! Maybe nail guns and screw drivers excite him?!? the drink or the tool? Since Pinocchio was a 10 yr old boy when the movie ended, don’t you think we should allow him to grow up a bit? Talk about robbing the cradle! Bwahahahahahahahaha. I just never thought of Pinocchio this way. You’re doing fabulous on your charity drive. Brilliant. I think the pharmacists nose just grew . Never has someone wanted termites less! And let’s hope he doesn’t have to lie to keep things going. One to one…don’t they cancel each other out. So Pinocchio has the only girlfriend that is happy he lies to her? As long as the wood isn’t from a rubber tree! He’s not going to have much use for them anyway, dressed like that! haha he never did learn. For Pinocchio and his partner’s sake, I hope splinters are NOT a side effect. That poor kid. He’s too young! He wood be better off without it. Sounds like something Seth MacFarlane would create. Possible side effect: Branching out. Thorns. Vines. Also, congrats on a successful fundraiser, Bearman!